BLOODSTOCK is excited to announce further details of 2018’s onsite RAM Gallery, one of the more unique elements that sets BLOODSTOCK apart from other festivals. 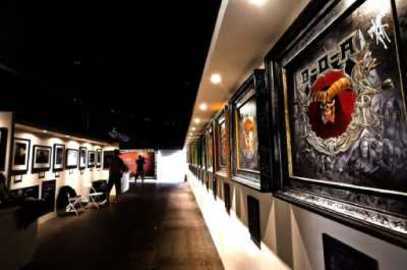 Festival founder and globally renowned artist, Paul Raymond Gregory created the onsite RAM Gallery in 2014 and each year the purpose-built structure showcases not only some of Paul’s work, but several other BLOODSTOCK-related rock and metal-friendly artists and creatives. Gojira drummer and artist, Mario Duplantier will be exhibiting some new art prints alongside the Gojira Cynosure creation. Also showing work are two world renowned photographers, Paul Harries and Ester Segarra. Paul will be showing and selling copies of 9 prints, including shots of Judas Priest’s Rob Halford, Metallica’s James Hetfield and Robb Flynn of Machine Head. Ester will be there presenting her hot-off-the-press new photographic book, ‘Ars Umbra’. Lastly, but most definitely not least, Paul Raymond Gregory will be exhibiting original artwork from Molly Hatchet’s discography to celebrate their 40th Anniversary as a band and his 40th anniversary as an artist. The Hatchet artwork will sit betwixt Cynosure’s two bespoke Hatchet-themed guitars. He will also have other prints available from album artwork throughout his career, including Saxon’s ‘Heavy Metal Thunder’ and Molly Hatchet’s ‘Devil’s Canyon’. The art prints are also signed by Paul and Saxon frontman, Biff Byford and Paul and Molly Hatchet guitarist, Bobby Ingram respectively. BLOODSTOCK weekend tickets with camping are still available at £145 (+ bkg fee), with children’s weekend tickets only £35 (+ bkg fee). Kids under 4 years go free! Weekend tickets are selling faster than ever and like last year, are likely to sell out before the event, so don’t delay if you want to guarantee entry to the UK’s best metal weekender! Adult one day tickets remain available priced £65 (+ bkg fee) and child day tickets at £20 (+ bkg fee) over at http://bloodstock.seetickets.com. Thinking about how to get to BLOODSTOCK? Official travel partner BIG GREEN COACH are more than happy to transport you and all your camping gear from 23 pick-up points all over the country to right inside the festival gates. Check out the details at https://youtu.be/wqT7Rt2B60E. Alternatively, if you’re driving to the festival and have a space in your car or are seeking to hitch a ride from your area, post your trip on GOCARSHARE’s website to match up with a friendly metaller and help each other travel to BLOODSTOCK! You’ll even be in with a chance of winning a pair of tickets to next year’s festival just by using the GOCARSHARE scheme. Full details over at http://gocarshare.com/festival/bloodstock.